Taipei is here because of the river. The clear, drinkable water of the Keelong, Danshui and Xindian Rivers is still in the living memory of the communities along the rivers. For these people and for Taipei the rivers have been the everyday source of life. This is time before the flood walls and time before the city was separated from its natural environment. Taipei still carries the river in its collective memory and so the city has not yet become a total industrial fiction. But new memories need to be made and fast. The rivers must become again the lifeline and nerve system of the urbanized Taipei Basin. A new kind of urbanism must be created living in straight dialog with the river nature; landscape urbanism from the viewpoint of the river: Taipei River Urbanism. The Jiantai fishermen have been operating on the Keelong and Danshui Rivers for generations fishing, crabbing and transporting cargo and people on the rivers. They used to carry their Local God with his temple to higher grounds when the river was flooding. The river was so clean that they could drink the water. Flood came every year, the boat building master told us, but it was not so bad since there was no flood walls: the water have plenty of space to spread around. He showed the level below his knee where the water used to rise during the typhoon. Missis Chen has been living together with the Xindian River all her life. She and her husband used to work for a construction company that harvested sand from the river bottom. Missis Chen participated in the work and she also cooked tea for the working men. These working men founded the Treasure Hill community together with the KMT veterans from Mainland China. Because of the flood the Treasure Hill settlers did not build valuable properties to the flood area down the hill, but used that for secondary buildings such as pig houses and storages, but even the government wanted to “protect” them and bulldozed the houses away and in the end forbid them from farming. The pollution comes from the up-stream, Missis Chen says. Suddenly the river got so dirty that they could not eat the fish anymore. Even the dogs don’t eat the fish today. Before the pollution they drank the river water, washed their clothes and vegetables in the river and ate the fish and crabs. River was their everyday life. The Amis spokesman of the Xi Zhou village is a representative of a very brave riverside community. The descendants of the original three families from Taidong Amis the community have been fighting for their rights to live along the river. First the government destroyed their riverside farms and build a bicycle track instead. Same pattern as with Treasure Hill. Then the officials tried to kick the Amis from their homes and “resettle” them, as they did with the Treasure Hill’s original community. The Amis refused and have been fighting ever since. Now they are in a dialog with the government, who has proposed to move the village a bit further from the river and build to them new homes. The Amis think that the government houses will be nothing compared to their self build houses that form a unique organic community that is as much a garden as it is architecture. The Amis prefer to build their new homes by themselves too in the same organic way as the community is built now and keeping the same dialog with the neighbors and collective spaces. The Spokesman is 37 years old and tells us that he spent all his childhood with the river, who provided the community its everyday food. The collective farming along the river was as essential to the community sense as the river itself and those two cannot be separated in the Spokesman’s childhood memory. Then: the river got polluted. The Official aims in coming in-between human and nature; also in-between human and human nature. The official city is modern and inhumane. It wants to clean up the back-alleys of Taipei and beautify them. It prevents people from farming on the river banks. In fact it forbids any kind of plantations on the river banks, because they belong to the flood protection area. Missis Chen has been farming all her life on the Xindian River flood plains. So have the Amis settlers. For them the flood is natural and they kept on farming until the government came to “protect” them, as the school head-master came to protect naughty Alex “from himself”. (Stanley Kubrick: A Clockwork Orange) In official point of view when human gets close to nature including human nature, he approaches danger. He can get out of control. River can get out of control – at least out of human control. It is almost as if it supposed not to be controlled by human. Industrial city is an ultimate manifest of human control, a machinery to regulate human life. This machine and the hydraulics of nature seem to be in some sort of conflict trying to fit together in the same Taipei Basin. The river is flooding, which is something that the city doesn’t want and the city is polluting which is something that the river doesn’t want. An easy, almost fast-food solution was to build a wall between the city and the river. The flood and the rest of the water is supposed to stay on the other, “organic” side of the city-river coexistence and the wall also keeps the stinky and polluted water out of sight. Out of sight, out of mind. The wall has been up already a couple of generations. For the young Taipei citizens the river hardly exists, nature has become a fiction. Now the city government has admitted that building the wall and polluting the river has been kind of an “official mistake” and tries to find strategies to make this up for the citizens. They build bicycle ways to the river banks and paint official graffiti on the wall. Riverside parks are being created and citizens are encouraged to cherish the “blue highway”. Same time citizens are not allowed to create spontaneous community farms along the rivers and the wall has not moved anywhere. River is allowed to exist only under the official control as the citizens are only allowed to be with the river under the same official control. Taiwanese nature, as any nature is against any kind of control. The only rule of nature is existence maximum, to produce maximal life in the given conditions. This goes for the jungle and this goes for the communities in the Taipei Basin. Organic human settlements can find a way how to coexist with the rest of the nature. This has been the reality also in Taipei before the hyper-industrialism. With the industrial-economic growth the co-existence with nature has been forgotten and the people and communities living along the environment are seen as garbage. Now that the environmental consciousness has become an “international trend” also Taipei has become to realize, that it is actually a river city. Now the big question with this urban ecological awakening is whether urban nature (river, mountains, jungle, wetlands…) is continued to be seen as an almost virtual ecological amusement park, or can the official Taipei accept nature to be real? Can the river be real and are the citizens allowed to do real things with real nature? Is a grandmother allowed to establish a vegetable garden along the river and take clean water from the stream? 1. Fresh water from the mountains is collected to the sweet-water reservoirs of Wulai and Taoyuen from where it is directed to the purification plants in a couple of points around the city. From these water centers the drinking water is the directed to the households and other water consumer units. 2. After the consumption dirty water including sewage and grey waters are collected to the Dihua, Neihu and Bali sewage treatment plants from where the clean water is again released either to the rivers or into the Taiwan Strait. The natural river restoration in Taipei’s urban conditions requires knew kind of socio-ecological knowledge building and decision making. The different river related departments of the city government (river, hydraulic, environmental protection, urban development, urban design, public works etc.) admit that they are lacking cross-disciplinary co-operation and that they don’t see any participatory planning around the urban river restoration issue, but that they want this. They want to get out from their corners and also give space for the other department to come to their territories. They want to co-operate, but the problem is: every corner has a king. These kings lay down the disciplines and official power hierarchies that cannot tolerate any changes and that feel every spontaneous move as a threat. These kings make sure their officials protect their territories against the other department. “No, you cannot plant here anything: the river banks belong to the river department.” And to make things even more complicated around the river is not only all the Taipei City departments but also the Taipei County and the Central Government fighting for their rights to control. Meanwhile: nothing happens. In the middle of the Danshui River should be set up a boat. A new Noah’s Ark where the representatives of the shareholders of the river would gather for participatory planning. Besides the different city, county and central government officials there would be scholars, scientists, NGO’s and the representatives of the Local Knowledge. Missis Chen would be there, the Jiantai fishermen and the Amis. This participatory planning would lead into decision making concerning the river restoration and the relationship between the city and the river. Maybe the participatory planning would be chaired by United Nations? 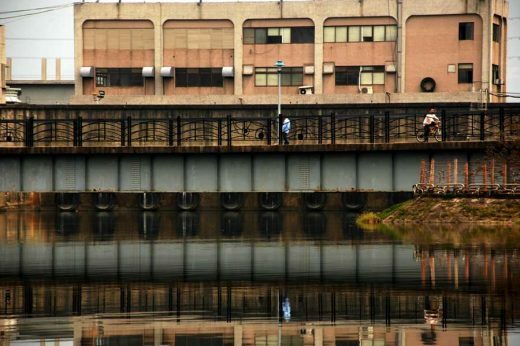 The UN-HABITAT is looking for an urban river case that could be used as an example for other similar kind of cases around the world. Taipei could lead the way. Cleaning the river and creating sustainable River Urbanism is not a technological question, it is a question of communication and participatory planning. The Taipei River Urbanism will be cooked up with five elements: Local Knowledge, Collective Ownership, Environmental Technology, Natural River Restoration and Architecture. Local Knowledge anchors the future Taipei sustainable development to the real memories and site-specific knowledge of living together with the river nature. Urban farming and community gardens have always existed together with the river. This Taiwanese phenomenon should be encouraged as a vital part of the River Urbanism. The gardens can be connected to more complex systems of citizen initiated constructions and even alternative communities along the rivers following the examples of the Amis and the Treasure Hill. Fishing, crabbing and aquaculture will restart automatically after the water quality reaches an acceptable level as will boating, swimming and other physical activities with the rivers. Collective Ownership binds the citizens to the restoration process by taking them into the development as shareholders. The ownership sense is critical to the reunion of the city and the river. In case the citizens do not feel as the shareholders of the future river nature the city will remain behind the wall and the river as drive-in amusement park. Environmental Technology will provide solutions for various sectors of the River Urbanism with sustainable energy production, pollution control and treatment and flood management. Different sustainable energy solutions will be examined in the river corridors. Small scale wind energy can power local installations such as community gardens and alternative communities. Tidal energy can be an alternative in the river mouth area where the tidal pulse effects the river all the way to Zhuwei-Guandu. Fast growing bio-mass can be grown on the river banks and harvested from boats to fuel bio-energy plants in selected locations. The Taipei climate and the fertile river banks are optimal for bio-mass cultivation. The biomass and tidal energy must be tuned together with the free flooding plan. Too fast steps may increase the flood level while the flood-walls still exist. Solar energy can be produced also on floating installations. Environmental technology will increase the effectiveness of the existing sewage treatment plants and help to take care of the remaining sources of pollution. Local purification installations and dry toilet systems can be offered to the areas still out of the sewage grid. Natural River Restoration will apply the existing knowledge of river restoration but in urban conditions. The River Restoration is based on free flooding which will eventually mean the removal of the flood walls after the community scale flood control infrastructure is completed in Taipei. The sedimentation pollution will be removed from the river bottoms and treated. The river bank soil will be either removed and treated or the pollutants will be tied into vegetation as for example part of the biomass production. Wetland areas will be introduced together with riverbank vegetation and eventually connected to the mountain jungles as green corridors in order to increase bio diversity and to treat the water and soil. Probably the most challenging part of the natural river restoration will be the element of free flooding. Community scale underground storm water reservoirs will be built in the flood areas of the Taipei Basin rendering the Tokyo underground typhoon reservoir mega-structures but as a de-centralized system. After the underground storm water capacity is in function the flood-walls will be removed; city and the river will be reunited. Architecture will still define the human built environment of the Taipei River Urbanism, but in closer connection with the organic growth and the water movement. The Local Knowledge will give solutions into more organic construction and community sense. The free flooding will present new challenges for housing and infrastructure where also the static and industrially built architecture has to give up in order to let nature to step in. The urban environmental conditions will not be aimed to be fixed and controlled, but flexible and Open Form. Taipei and Taiwan has a high standard of illegal citizen built architecture. This spontaneous culture or gardening buildings should be encouraged and supported. The River Urbanism will step back from the developer or official initiated construction and make more room for citizen architecture. The DIY architecture can start in small scale on the river banks as part of the community gardens and it can also start building mediating areas over the flood wall connecting the city to the organic side. The presentation at the Ruin Academy, Taipei 26.3.2011 is a result of a research and workshop conducted in co-operation between the Aalto University SGT Sustainable Global Technologies, Finland + Tamkang University Department of Architecture, Taiwan + National Taiwan University Department of Sociology. Sincere thanks to all the researchers, students and professors – especially Professor Chen Cheng-Chen from Tamkang and Professor Tseng Yen-Fen from NTU. The Taipei River Urbanism workshop was kindly supported by the JUT Foundation for Arts and Architecture. The Ruin Academy Taipei is operated in co-operation between Casagrande Laboratory / Finland and JUT Foundation for Arts & Architecture / Taiwan. C-Laboratory is a Finland-based research – design & build co-operative of architects, artists and social scientists working freely in-between architecture and other disciplines of art and science within the general framework of built human environment. We realize ultra-ruins, cross-over architecture and finally the Third Generation City.